Way back in July I really fancied making a few decorative slabs for the sitty-out area we would eventually have. 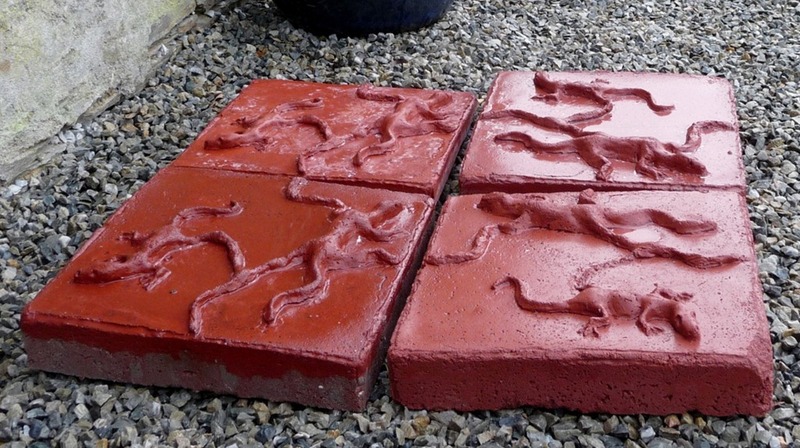 I could have researched it properly or bought decorative moulds but I desperately wanted lizards (not an obsession) and snakes growing from a central slab. So the idea just sat about in my head being faintly irritating until I bought some latex. No, not that kind of latex. 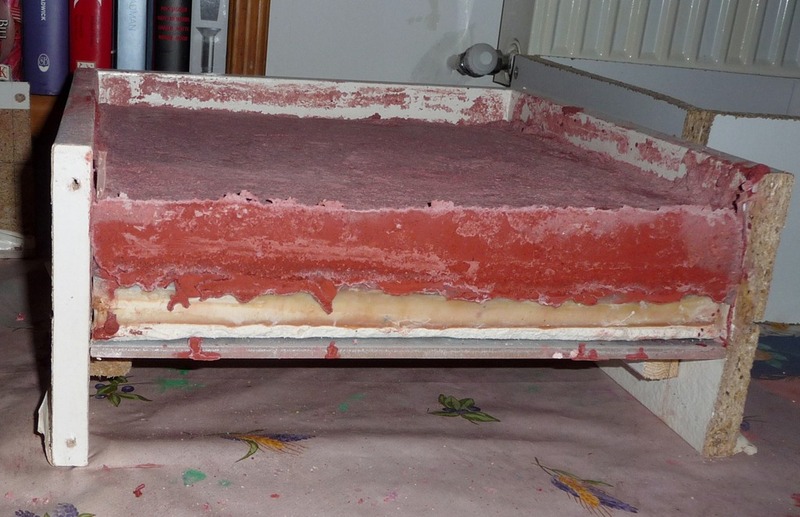 This was liquid latex for making moulds. Unfortunately there wasn’t a great deal of enthusiasm from the other half so I hit on the happy notion of asking all my family to buy it for me as a birthday present. Fantastic. The only thing I needed to know was how to make concrete. Thanks Roger for showing me. I am a bit peeved that none of my mixes have as good a finish as yours but into each life a little rain must fall. Anyway on the whole it has turned out like the picture in my head. 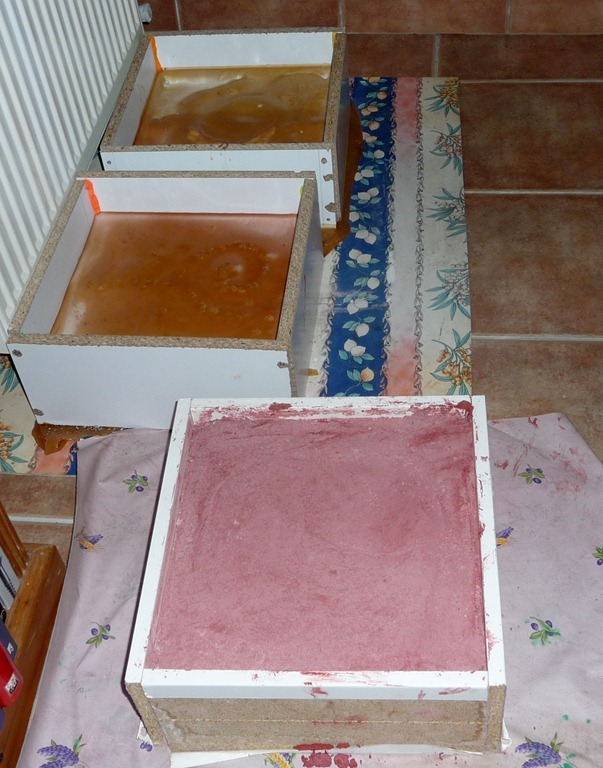 The colour of the lizard slabs has just avoided pink and I can’t wait for the mould of the snakes and leaves to dry so I can try some extremely suspect “Sky Blue” concrete colourant. It’s remarkably like lime green in the tub. This could mean I have to crack out the useful sachet of blue fabric dye I have stashed away for just such an emergency. I am currently preening myself over my incredible foresight. There were a few problems, mostly related to my impatience. Mind you, I’d been patient for months so I was due a lapse. It didn’t help that I dropped one slab before it was set properly so a bit of the design rearranged itself. The other thing was the latex leaking out of the box before it could set. Oh, and one of the cats decided to lie in the latex while it was still liquid and I had to do some cat trimming which was fraught for both of us. Thank God for welding gloves. I made the original design out of clay which meant that there was quite a bit of mess here and there but it did clean up very well indeed. Not quite so easy to clean up after my first latex pouring or dealing with my cavalier approach to mixing the concrete but I do have a bowl that is reserved for concrete alone. The ladle didn’t clean up and I recommend using something else to dollop it into the mould. A trowel is the obvious choice but I thought a ladle would be easier. It is but you need one dedicated to the task because it’ll never touch soup again. …and not getting distracted by some other interesting ideas. 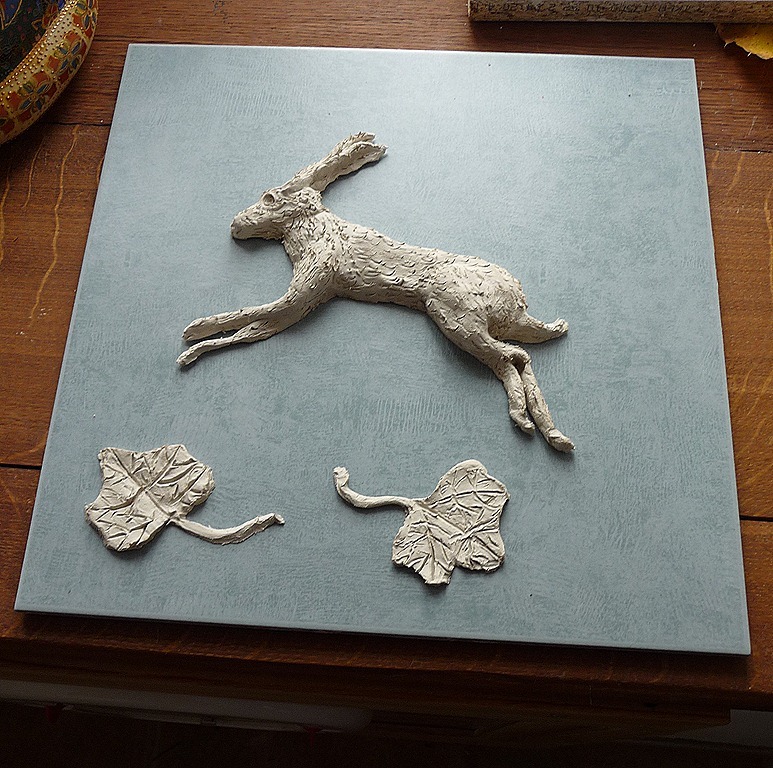 Now I’m going to try making a wall plaque with a running hare (not an obsession) design. I think I need white cement and finer sand. Thanks for the advice Rog. I’ve got the clay model ready and am planning to commandeer a pot roasting tin thing to do it in, but only if nobody notices that it’s not fulfilling it’s intended function. Failing that it’s back to the drawing board. It might mean I have to make something which could actually be an interesting project in itself. It occurs to me that I could use the chainsaw to cut shapes from the pear tree branches and use the glue gun to turn them into a sort of box. In fact that would be better than the pot roasting thingy anyway and I could feel virtuous about the whole process. It would definitely give a more organic shape to it and as that’s closer to what’s in my head than geometric designs it can only be a good move. In fact I’m off to have an in depth examination of the dead bits of the tree now.